Arpita what to say about her,I can write a whole book about her. She is new to me every day. I congratulate her for her film bodhon where she won the best actress in North Carolina Film Festival.I am so proud of her. Going back to my past memories from the first day all I remember about her is a girl who was so involved in her work. She is smart focused, someone who does a lots of research and put a lot of hard work into her character. I still remember when we 1st worked together in a film ‘TumiEle Tai’ by Prabhatroy. She always had the eagerness to learn more.She was a girl who always discussed about her scene and always seeks ways to improve herself and her acting abilities. That what I loved about her the most. I still remember during the shooting of the movie Devdas how she took tips from me and always eager to experiment something new and innovate which I love about her the most.I think the same thing has been there even during Force that we did together after 12 years. Her hungriness for learning new and innovative things hasn’t changed a bit even after so many years.And I truly believe this is what is helping her to get more challenging works starting from Bodhon to Onir’s Chauranga and Shab. Arpita is someone I really adore and the most important person in my life. I never helped her to become where she is now. We don’t have too much professionalism in our relationship. We believe it’s our hard work that will earn us a film or be it fame. We never recommended each other to anyone. At home also we make it a point that we don’t discuss about our work. But yes as being her husband I always advice her when she needs me and it’s vice versa, a very understanding feeling. At home we are like normal coupleand I believe personal and professional life should not be mingled together. Whatever she is doing and where ever she is standing now is completely for her own hard work and sincerity. Now Arpita is my son’s mother. She has done proper justice being a wife as well as mother. She took a long break from her career and wanted to indulge in being my son’s mother only. As she believes being mother is always in her top priority list which I always appreciated. She never gave me a chance to complain. Now after 10 years Arpita decided to come back and focused on her career. Even I believe so as its high time that she should start working again. Because I believe we will get to see the amazing actor once again. Behind every successful man there is always a hardworking and wise woman’s hand and for me undoubtedly it is. She has changed me as a human being and my life and wherever I am now. Her award winning film Bodhon is releasing today, and I wish her all the luck for all her hard work. I am proud of her and I know she will always make me proud. I congratulate her and thank her for being there for me and being part of my life. The love affair between Kolkatans and books is continuing effortlessly ages after ages and the romance along with the bookish smell is in the air. The 39th International Book Fair started today, our “annual book extravaganza”. Is it only the books and literature and culture we go gaga about? No! Book fair is much beyond that. Book Fair is a festival for us that we celebrate with books! I think every child from a middle class Bengali family visit Book Fair with family. I also visited Book Fair several times in my boyhood. After checking out few books and buying a few we used to search for our favourite writers and poets to get an autographed copy of their new books. The blissful warmth of the Sun in those winter afternoon used to make the atmosphere perfectly in tune with our salad day’s enthusiasm. I wish like every other grown up individual to get back to those days of pure joy and nothing else. I feel bad for Mishuk. He is missing this very important flavor of our very own Kolkata as I hardly get time to accompany him and also because he is not in Kolkata during this period. Last year I went after a long time, to launch the book for Gautam Bhattacharya on Sachin Tendulkar. Meeting new people has always been a pleasure to me. Interaction with today’s book enthusiasts, little mag editors, renowned authors, singers, politicians enriched me like always. Shirshendu Da (Mukherjee) was there surrounded with children, young people and middle aged persons. This showed that people from every age enjoy his writings. Boi Mela has always been the part of our growing up. The divinely smell of the new books is incomparable! But today, other than the books there are other attractions to pull the huge crowd in the fair. I doubt how many of them really go there to enjoy the “cultural” aspect or buy books. It has become a trend to visit book fair if you consider yourself an “intellectual”. Do the youth really read books buying one? Of course, e-books are there. But does that really quench the fun of reading a book holding in front of your eyes? I may sound old, but I still prefer to hold a book and read. Last year I found, the crowd is thicker near the food joints rather than in book stalls. People sitting in small groups were having their fun time playing cards and chatting and singing. God bless you all! Take care. Only this man has the persona to utter this line. Literally! So glad am I to hear the news! Mr. Amitabh Bachchan has won the highest prestigious award in the country “Padma Vibhushan”. From comedies to romance to action to drama, the Superstar of the Millennium has done it all. It is a delight to see Mr. Bachchan possessing the same grace, vibrancy and enthusiasm in his 70s. Every day he is experimenting with himself to create something new. Driven by the passionate force of creating and producing good work this man has challenged the actor within him every time he appeared on screen. I feel proud to share the screen space with him in ‘The Last Lear’. So humbly he was interacting with the actors, technicians and all the people around him. 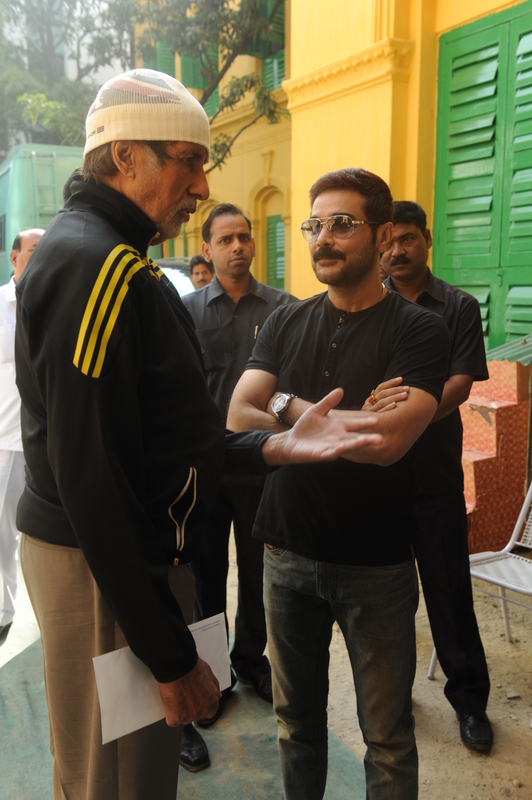 Interacting with a legend like him was one of the few valuable moments of my life I’ll always cherish. It is amazing to see a Superstar like him appreciating me for my work made me feel comfortable. I’m thankful to him. I feel, you can only get such love from people and become a big name if you continue doing your work being grounded. That is all that matters. The craze for Amitabh Bachchan is still unparalleled. There was a time, I remember, we used to fight for the first day first show ticket of his film. Watching a film in theatre was kind of a celebration for us. The amazing thing about Amitabh Bachchan is he did not restrict himself within a certain genre. From comedies to a serious role he did it all.His films were both commercially and critically successful. This is something to learn from him among his plenty of qualities. His expressions in the snow falling scene in “Black” just made me spellbound. I got goose bumps while watching the movie. From the “angry young man” of ‘Deewar’ to the youngest old man uttering “Buddha Hoga Tera Baap” he has grown young. He didn’t look a bit mismatch opposite to Tabbu in “Cheeni Kam” with that cool Versace specs and little ponytail. It is amazing to know that this legendary actor had made his film debut not as an actor but a voice narrator in Mrinal Sen’s National Award winning film “Bhuvan Shome”. Talking about his voice, today I heard the National Anthem sung by him in Jorashanko Thakurbari. Seeing him singing in front of the statue of Rabindra Nath Tagore in that white Kurta is absolutely a treat to the senses. Head downs with respect to see him singing with that calm and confident gesture. Congratulations to Mr. Bachchan for winning such a prestigious honour which he very much deserves! Keep inspiring us. Wow! We have already come across 66 glorious years of the establishment of democracy. The idea of democracy is still a topic of debate and discussions. Democracy can be considered the best form of government as it claims the power remains in people’s hands. But what happens after that? The greatest irony lies there. We want to change the situation, but situations often succeed to change us! I just remember, there was a dialogue in “22 She Srabon”, for most of the people democracy means the right to vote. We claim us the citizens of the biggest democracy called India. We can choose our government. That’s it! But what about the changes we wanted from the new government? We are exposed to suffer for another few years. Thus years pass, we move on. No, I’ll not complain. Because being a citizen of this country, I failed to bring about the change I wanted. I failed to save the girl child in a remote village from being raped by her in-laws, I failed to save the innocent boy from the Eastern part of the country who came to study in a renowned college from being a victim to racism, I failed to save the first year student from being inhumanly tortured by his seniors in the name of “ragging”, I failed to provide food to the farmer who chose to commit suicide to escape from the utter poverty, I failed to save the innocence of a kid in Jammu Kashmir who is learning how to aim perfectly with a gun as part of his “art of living”, I failed to save thousands of Nirbhaya of my country. I failed to inspire. Yes, we are all responsible for these. The problem is we are so good in accepting things. We get accustomed to the situation very easily. It is not that our conscience remains quiet all the time. But we refrain ourselves from bothering too much by considering that we are “common people”, what can we do? But let me remind us, the number of common people is much greater than the number of those “Powerful” one. We can bring about the change in us, don’t we? Can we be a little responsible towards the people around us? Can we listen to our conscience? Can we dream of a better nation in near future? Of course, we can. We all can at least do our part of goodness. Let’s take a pledge! As SRK says, don’t underestimate the power of a common man! So, please don’t let this day to remain just another holiday to cherish your laziness. Let’s bring about some changes in ourselves. Let’s utilize the opportunity of being a citizen of this largest democracy. It was yesterday, I never thought my day would start by accidentally meeting the famous ‘Dream Girl’. ‘Dream Girl’ the name doesn’t required any other introduction. O!!! What a coincidence. It was a sudden encounter with the beautiful Hema Malini! With that serenity, grace and poise she walked down and we exchanged warm smile. I went for a meeting in ITC without knowing that she was there for some engagements. It’s been ages we met. Hemaji is still that divinely beautiful. No wonder, still she has a huge fan following who are struck by the aura of grace around her. I belong to that generation when we used to fall for the divas like Hema Malini, Rekhaji, Jaya Bhaduri, Parveen Babi and many others. Who can forget her outstanding performances in ‘Johny Mera Naam’, ‘Satte Pe Satta’, ‘Lal Patthar’, ‘Andaz’ and the list continues. I have lost count how many times I watched Seeta Aur Geeta! I especially liked the scene where Geeta, chased by the policemen jumps above a wall and ends up entering into the car of Sanjeev Kapoor. Am I missing something else! Of course, how can I forget the chatterbox Basanti in Sholay! Sholay is a film that will never become old.I still enjoy every bit of it. I’m still feeling the excitement. Lost in old memories, humming the above song in my mind. Its was a day well spent …Love you all! It’s been one year now, Antony Firingee resurrected in Bengal through “Jaatishwar” directed by Srijit Mukherjee. Feeling nostalgic! A handful of memories are gathering on the tip of my nib. The shooting days were filled with so much fun! Talking about “Antony Firingee”, the first thing comes into my mind is Uttam Jethu. Before the release of Jaatishwar, most of the people thought it would be a remake. Thanks to Srijit, he made Antony a reality. Unsettling the dust from the old black and white classic of Uttam Jethu and pages from history books, Srijit presented a new elusive Antony with his passion for Bengali literature, songs, Kabiyals, Kali Kirtan. His research on this not so popular historic persona was reflected in every frame of this movie. To fit in Kushal Hazra’s character in the film, I had to do lot of experiments on my looks. While doing the unique hairstyle, the hair dresser purposely did that awful experiment with my hair. The well maintained hair had been cut mercilessly and efforts had been put to make it look ugly.The character ‘Kushal Hazra’ is lonely, devoid of friends and family, haunted by his past life memory. From where would he get the urge to maintain himself? This was Srijit’s logic behind the look made for him. And he was right. To portray this character my normal diet took a long leave. As I only survived on fruit juice those days to look like a broken and shattered man going through a strange phase of life soaked in depression, anxiety and loneliness. I used to wear a bandana to hide my pathetic hairstyle those days. But surprisingly, it became a style statement. Haha! Let me share with you some, what they call it, “Trivia”! Jaatishwar is the first Bengali film where helicam had been used in the scene Antony holding the dead body of his wife. Real huts were made and they were burnt originally. The scene looked absolutely great on screen, for that real smoke and flame. Talking about “Jaatishwar”, how can I forget to mention the mesmerizing music composed by Kabir Suman. Oh! It’s so pure, so wrapped up in affection, so soothing! There are few lyrics of the songs I’m so much in love with. “Jaatishwar” for me is a box of nostalgia, a tribute to the embryonic stage of music. It was an amazing musical journey all together. Love you all. Take care! More than 30years have been spent in this industry, still my heart beats fast when I stand in front of the audience at the premiere shows. I feel nervous. Yesterday was the premiere of “Lorai.” This is a very special film for me. We go through so many ‘Lorai’ every day; we give up, get shattered and then rise again to face another ‘Lorai’. Param said something lovely yesterday. While shooting for a film, we work together for several days like a family. Once the film is released, it feels sad to think that we can’t do anything more. I also feel like that. We live the characters for so many days and then it does not belong to us. The crucial Fridays announce the report card of our month’s long hard work. This anxiousness I feel every time my film releases. In ‘Lorai’, my character Ryan is himself a loser in life from both professional and personal aspect. He is an escapist too. But finally, we don’t reach anywhere by escaping from our situation. We need to stay back and fight. In my life also, there were situation where I wanted to escape but I could not as I was aware of my responsibilities towards my mother and sister. Many times, life has put me in front of dire situations where I had no option but to win. Bob Marley said, you don’t know how strong you are unless being strong is the only option you have! These words are utterly true. Just being nostalgic to remember how we shot in Purulia in the midst of 45 degree temperature. While shooting for this film we came across people who were struggling everyday to live. And we, sitting in our elaborate drawing hall only criticize system without doing anything. We desire so many things and keep on complaining. I also feel like that. But whenever these thoughts come to my mind, I tell myself at least I can fulfil the bare minimum needs of my family; I’m lucky. Suffering is there in everyone’s life. The ‘Lorai’ to overcome that and start afresh is the sign of a real winner. Ah, lost in thoughts, I guess! It was a wonderful evening. I thank everyone for attending the premiere and showering their best wishes on the whole team. I would like to request everyone to go and watch the movie in the theatre and be a part of our ‘Lorai’. Love you all. God bless. Time to return. It was a pleasant stay in Mumbai. Mumbai has a different charm. At first, you may feel puzzled by the cacophony but once you get settled into its rhythm, you’ll cherish every moment, every corner of the city. Mumbai is aggressively modern, glamorous and dazzling cosmopolitan. Though there are some parts of the city where you can see life very closely, where glamour fades under the struggle to arrange the basic needs for everyday. Such the conflict! The financial powerhouse, the fashion capital…whatever title you give to Mumbai, it has its own language which you need to pick up as soon as possible if you have a plan to stay there. Finally back to Kolkata, early morning flights are a real turn off for me. I mean, morning is the best time to concentrate on yourself. Whatever you do in the morning putting your heart into it, cannot go wrong. And here, you have to wake up early in the morning just to travel. Such a waste! Thinking about the work list I’ve to accomplish today. I have a show at Halisohor. I’m waiting to meet my friends and followers there. Actually, these shows help me to reach the maximum people personally and I love that. The joy and excitement they show really encourage me a lot. The loud cheer, the smile, the laughter, the emotions are priceless. I fill every corner of my heart with the love showered on me and plunge myself into new challenges as an actor with boosted confidence and joy to reach another summit. Be with me always. Love you all. Take care. Many of our children stay apart from us. Career, job, ambition-different people have different reasons. We see them growing up in front of our eyes, spend golden moments playing, laughing, crying and suddenly we have to part ways sometimes, for their well being. 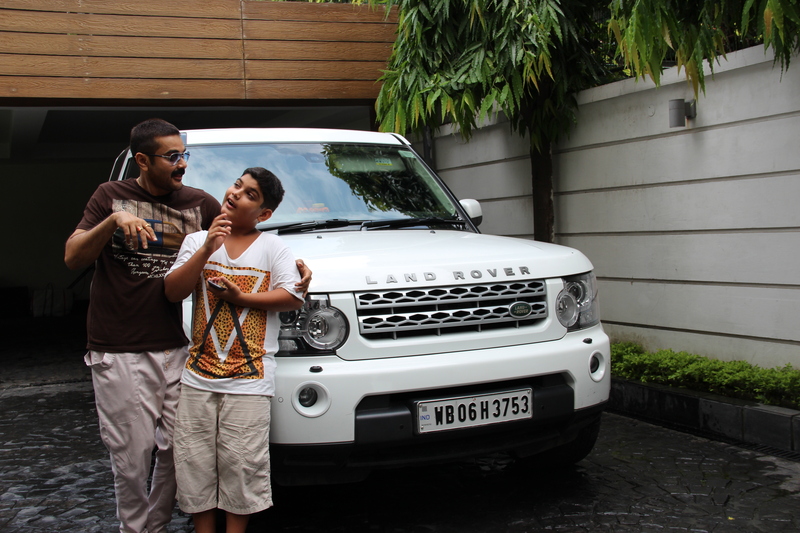 Mishuk’s much awaited Christmas vacation just came to an end. He went back to his hostel yesterday. The days flew so fast! So much planning we do before he comes for his vacation. Before coming, he always asks me, “Baba, what have you planned for me?” His face glows with excitement. From watching soccer match together to decorating Christmas tree, we the father-son duo accompany each other in every occasion. Though most of the time I was busy this year for ‘Lorai’ promotion and other events, I made sure not to deceive him from his own share of attention from me. Ah! Missing him so much. 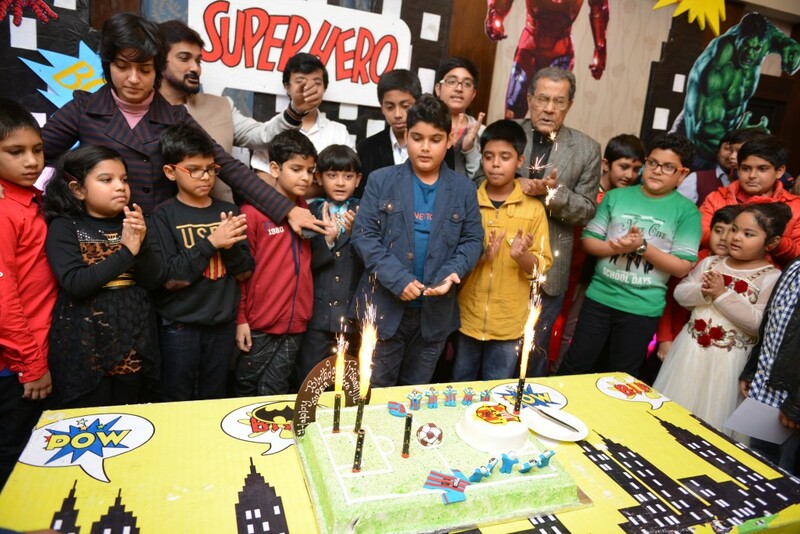 At his birthday party too, when most of the guests left, he came to me and just said, “Baba, only two days left!” I could see the deep melancholy in his eyes. He looked sad. I hugged him tight and kissed on his forehead assuring him I will always be there with him. He should never feel alone. For sometimes, the calm emptiness was engulfing me. But I can’t allow myself to cherish this sadness for a long time. And the best way to overcome it is to get involved in my work. Rehearsing, reading scripts, visualizing scenes actually keeping my mind busy. I am in Mumbai for some important meetings for two days. After returning, I’m going to be very busy with the preparation of ‘Shankhachil’. As I told earlier, this is going to be a challenging role for me and I can’t help but to give my best into it. My team is also engrossed in pre production arrangements to make sure everything goes well. I’m really thankful for having such an enthusiastic young brigade beside me who are very dedicated and sincere to their job. Your support is really commendable. Love you all! God bless. “He wraps his little arms around me and says God will make things right! I don’t believe in any religious concept about Hell. It’s just a state of mind. Every day we deal with our shares of problems and troubles. But at the end of the day, we are all the same ordinary people seeking little warmth from our children. I’m unfortunate to enjoy this bliss everyday as Mishuk lives in hostel and his Christmas vacation is about to end. Though his birthday is on 6th January, we celebrated it on 1st as he is leaving for his hostel today. What an evening it was! Friends and family gathered at Hotel Hindustan International, to bless Mishuk. But the actual fun was to see the kids having their best times. The party games were the center of attraction for all of them. Mishuk along with his friends became the jumping jacks, giggling, bumping into one another continuously. Though me and Arpita were busy attending the guests, I was observing them from a distance. A pure, happy lot just living the moment. The real fun began when the dads started to roll up their sleeves to compete the kids in Bull’s Eye game. They were actually taking it seriously. But unfortunately, most of them failed to hit the target. But they did not fail to entertain the kids with their pathetic performance! Once I just overheard the conversation between Mishuk and his friends. They were talking about technology! They were all participating in that conversation to express their views on some particular gadget, phone, games etc. This generation is actually well advanced than what we were on their age. I thank all my industry friends, family and well wishers for attending the birthday party and showering blessings to Mishuk. All of us get hardly a little time for ourselves. From their superbusy schedule, they took out time to come. I’m grateful to all of them because they not only just attended the party but also became a part of the Bachcha party by accompanying them in the silly pranks and fun-games! I think we all lived our childhood for a few moments that day! Last but not the least, I bless Mishuk from the core of my heart and want him to become a man full of compassion and respect for the fellow human beings. Nothing else! Love you all.